The Best Wooden Dog Crates | Pupperton - 2' x 4' Large Pet Crate - READY TO SHIP! 2' x 4' Large Pet Crate - READY TO SHIP! READY-TO-SHIP and $150 OFF! A gorgeous and unique BURGUNDY-finished solid OAK hardwood 2' wide by 4' long by 26" tall (all dims. approx.) pet crate. This 100% premium natural American red oak hardwood pen comes with your choice of floor colors. The gate is on the 2' end and is hinged on the right side (the left side swings). Photo 1: Color* and woodgrain example of this crate being sold. Photo 2: Available floor color* selections. Photo 3: Crate gate configuration of pen being sold, but this is not a photo of the actual pen being sold (color is not correct). * Please note that colors are approximate due to variations device displays. The Pupperton 2'x4' model is an obvious in-home pet kenneling choice for owners that don't have enough space for a larger pet pen. In addition to your smaller pet, it's designed to also contain dishes for food and water, an inviting bed in the middle, lots of toys, and a potty pad, if necessary - everything for happy and content extended day-long pet safety and security! At just under 2' by 4' in size, this pen fit nicely against a wall or along the back of a sofa in the middle of the room. Our premium hardwoods and finishes are a natural fit for any decor, and ingenious product features make this pen just as easy to own as our larger flagship 4'x4' pen. We use only premium-grade hardwoods at Pupperton because quality shows. Choose from a vaiety of 100% premium solid hardwoods and stain colors. You can trust that the best confinement product available for smaller pets is this 100% American-made high-quality large in-home crate from Pupperton! 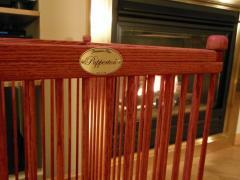 Its signed and serial-numbered heirloom quality will impress everyone that sees it for a lifetime! Size (external): 23-1/2"W x 47-3/8"L x 26"H.
Hinge side right on the shorter (2') panel.